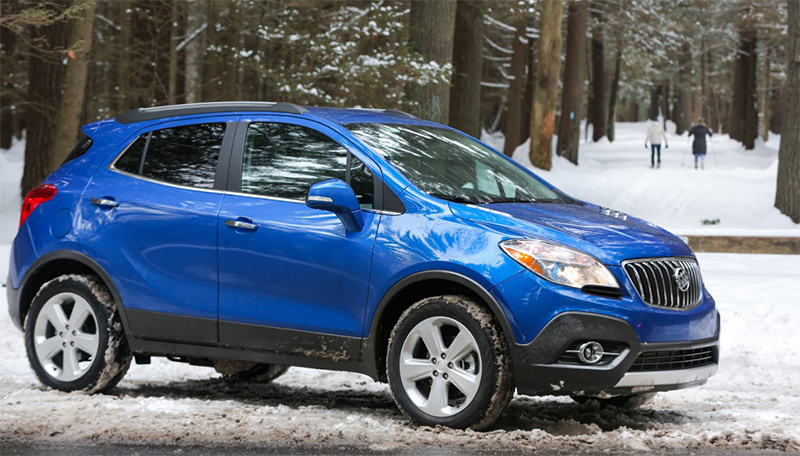 The Buick Encore has received high praise from customers who appreciate its distinctive package of safety and luxury features. In fact, they ranked it first in the crossover utility vehicle segment in both the 2013 J.D. Power Initial Quality and J.D. Power APEAL studies. It was also named Best Compact Crossover/SUV in Kelley Blue Book’s 2014 5-Year Cost to Own Awards. 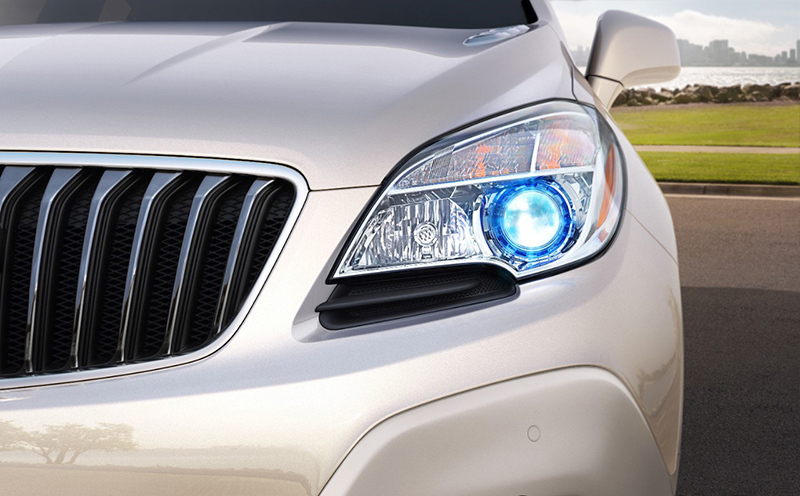 Encore is a small crossover that is unmatched in the luxury segment. It is maneuverable, versatile and efficient. With room for five and up to 48.4 cubic feet (1,371 liters) of storage space, it delivers substantial cargo capacity – along with a confident, higher driving position and available all-wheel drive. Buick’s exclusive QuietTuning is standard and includes Bose® Active Noise Cancellation technology. For 2015, Encore focuses on today’s ever-increasing need for advanced in-vehicle communication and infotainment access, with new OnStar with 4G LTE and standard built-in Wi-Fi hotspot. It provides a mobile hub for drivers and passengers to stay connected. The hotspot is on whenever the car is on and comes with a three-month/three-gigabyte data trial. The 2015 Encore is offered in four trim levels: Encore (1SB), Encore Convenience (1SD), Encore Leather (1SL) and Encore Premium (1SN). Standard features include 10 air bags, StabiliTrak stability enhancement and a 138-horsepower (102 kW) Ecotec 1.4L turbo four-cylinder/six-speed automatic powertrain, along with technologies such as Buick’s voice-activated IntelliLink. And when it comes to efficiency, Encore’s estimated 33-mpg highway (FWD models) is greater than competitors such as the Mini Countryman with the automatic transmission (30 mpg) and Volkswagen Tiguan (26 mpg). Experience Buick Protection on all 2015 Buick models includes two years/24,000 miles of scheduled maintenance, including oil changes, oil filter changes and tire rotations. It complements Buick’s four-year/50,000-mile bumper-to-bumper limited warranty and six-year/70,000-mile powertrain limited warranty. Encore’s sculpted styling identifies it as a contemporary Buick. Signature cues include a waterfall grille, chrome accents and surrounds, portholes on the hood and painted lower panels. Standard body-color door handles with chrome strips and a styled, stainless steel exhaust tip add to the premium look. Blue-accented halogen composite projector-beam headlamps and detailed taillamps further enhance the Encore exterior; and 18-inch, five-spoke painted aluminum wheels are standard. Seven-spoke chromed aluminum wheels are available. All eight exterior colors include a lower accent color: Quicksilver Metallic, Satin Steel Gray Metallic, Carbon Black Metallic, Ruby Red Metallic and Brilliant Blue Metallic (with Dark Argent Metallic lower accent); Cocoa Silver Metallic and Deep Espresso Brown Metallic (with Dark Cocoa Ash lower accent); and White Pearl Tricoat (Satin Nickel Metallic accent). Inside, the Encore’s distinctive styling carries over to a flowing instrument panel that wraps naturally into the door panels. A prominent central instrument panel houses the seven-inch, high-resolution, full-color display for the standard IntelliLink voice-activated infotainment system. It also features displays for the SiriusXM Satellite Radio and standard rearview camera, as well as the available GPS-enabled navigation system. An all-Ebony or a contemporary mix of dark and light tones distinguishes the cabin, which is accented with ice-blue ambient lighting and select use of chrome and woodgrain trim. Premium seats feature high-density foam for greater comfort on long drives. They are trimmed in either cloth/leatherette or available premium leather. Encore features ample storage, including eight beverage holders, storage in all four doors, four bins in the dash, pockets in the seatbacks and bins under the rear load floor around the spare tire. It offers 18.8 cubic feet (532 liters) of storage behind the split-folding rear seat and 48.4 cubic feet (1,371 liters) with the rear seat folded. The front passenger seat also folds flat to extend the cargo length and accommodate items up to eight feet long. Interior upholstery and color combinations include: upscale cloth with leatherette accents in a choice of Ebony or Medium Titanium with Ebony accents; and leather-appointed seats in a choice of Ebony, Medium Titanium with Ebony accents, and Saddle with Cocoa accents. New, upscale fabric seat inserts are offered on 1SB and 1SD trims for 2015. Eighteen-inch painted cast aluminum wheels. Encore Convenience (1SD) – Adds Convenience package: rear cross traffic alert and side blind zone alert, remote vehicle starter, electrochromic inside rearview mirror, dual-zone automatic climate control, 120-volt outlet and fog lamps. Encore Leather (1SL) – Adds Leather package: leather-appointed seating, heated steering wheel, power passenger seat, heated front seats and driver memory package. Encore Premium (1SN) – Adds Rainsense wipers, premium Bose seven-speaker audio system, front and rear park assist, forward collision alert, lane departure warning, cargo net and cargo mat. Options include the premium Bose audio system (Encore Convenience and Leather); GPS-enabled navigation (Encore Convenience, Leather and Premium); 18-inch chromed aluminum wheels (Encore Convenience, Leather and Premium); moonroof (Encore Convenience, Leather and Premium); and an oil pan heater. Encore’s IntelliLink system gives customers the best of both worlds when it comes to infotainment. It provides easy, intuitive operation of basic functions, yet it is also highly customizable and capable of linking up to 10 devices such as smartphones, SD cards and MP3 players, giving users more ways of staying connected. Enhanced connectivity and convenience includes a new Text Messaging Alerts feature for smartphone users with Bluetooth profile (M.A.P. ), which reads incoming texts through the vehicle’s speakers, and Siri Eyes Free for iPhone 4s or later, with iOS 6 or later, to enhance connectivity and convenience. Each enables voice-controlled connectivity, to help keep phones safely stored and hands on the wheel. In addition to icons covering everything from navigation to phone to Pandora, IntelliLink is designed to accommodate new features and enhancements and be highly customizable. It also incorporates natural language voice recognition that allows customers to safely place calls, enter destinations, browse media, play music and control other functions simply by telling the vehicle what to do. The IntelliLink system’s seven-inch-diagonal color screen also serves as the display for the standard rearview camera system and available navigation system, as well as the controller for Encore’s audio system. A premium, seven-speaker Bose audio system with amplifier is available on Convenience and Leather models and is standard on the Premium model. Complementing IntelliLink to enhance Encore’s connectivity is new OnStar with 4G LTE and standard built-in Wi-Fi hotspot. It provides a mobile hub for drivers and passengers to stay connected. The hotspot is on whenever the vehicle is on and comes with a three-month/three-gigabyte data trial, after which customers can purchase additional data. 4G LTE is the most current and fastest mobile data network – 10 times faster than 3G and 100 times faster than the previous generation of OnStar hardware. And with OnStar, it also offers stronger, broader coverage than smartphones on the same network and it’s easy to use: If the vehicle is on, the connection is on. At the time of purchase, six months OnStar Directions and Connections includes all of OnStar’s advisor-based safety and security features, including Automatic Crash Response and Stolen Vehicle Assistance, as well as turn-by-turn navigation. Five years of OnStar Basic Plan includes RemoteLink Key Fob Services, allowing owners to remotely start and lock/unlock a car (if properly equipped), and activate the horn and lights from anywhere with a data connection. It also includes OnStar Vehicle Diagnostics, which runs monthly checks of a vehicle’s engine, transmission, anti-lock brakes and more, and Dealer Maintenance Notification, which sends a diagnostic report directly to a preferred dealer to simplify service scheduling. Buick’s exclusive QuietTuning is designed to block or absorb sound and dampen or eliminate vibrations. For the Encore, specific content was applied to achieve 30 sound benchmarks for refinement, including Buick’s first application of Bose Active Noise Cancellation. It uses ceiling-mounted microphones to detect audible engine noise, the frequencies of which are processed by a computer that directs counteracting sound waves through the audio system’s speakers and subwoofer. 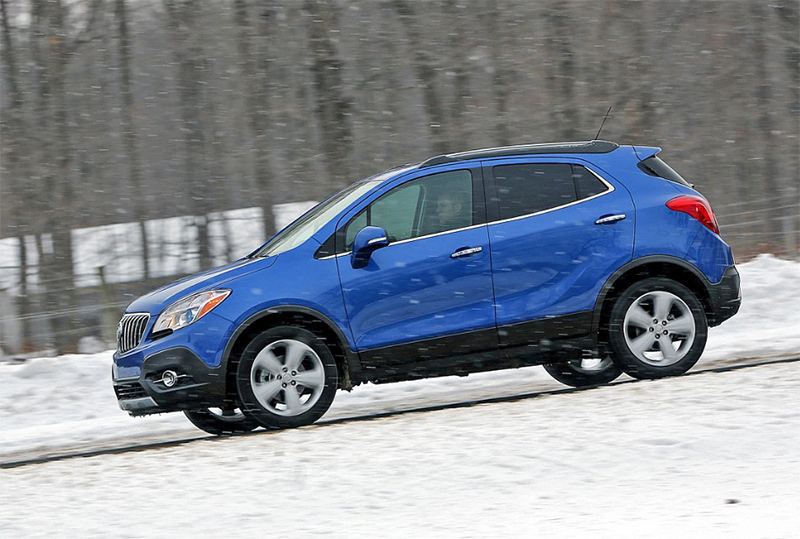 Buick Encore is powered by an efficient, power-dense Ecotec 1.4L turbocharged four-cylinder engine and six-speed automatic transmission. It generates an SAE-certified 138 horsepower (102 kW) and 148 lb.-ft. of torque (200 Nm) between 1,850 and 4,900 rpm. The wide rpm range for the maximum torque – a specific trait of turbocharged engines – helps it deliver a better driving experience and performance. A Hydra-Matic 6T40 six-speed automatic transmission backs the Ecotec 1.4L turbo engine. It is part of a family of six-speed front- and all-wheel-drive transaxles developed for small cars and crossovers. It has a unique design, with the planetary gearsets positioned on the same axis as the engine crankshaft centerline, making the entire powertrain unit shorter fore-to-aft. This design enables a shorter overall vehicle length, increased interior space, enhanced safety crush zones and lower weight. The Hydra-Matic 6T40 offers a “steep” first gear and a “tall” overdrive top gear to achieve a wide ratio spread of 6.14:1. This allows the Encore to achieve robust acceleration, as well as fuel efficiency and lower engine noise at highway cruising speeds. Encore is built on a global small-crossover platform and engineered with a “one-tire” philosophy. Everything is optimized around a single 18-inch tire specification, designed for a quieter interior, more precise suspension tuning and great driving refinement. A 100.6-inch (2,555 mm) wheelbase and wide stance – 60.6-inch (1,539 mm) front and rear tracks – contribute to a more confident-feeling driving experience, while Encore’s strong structure enables greater suspension precision and a quieter ride. Two hydraulic engine mounts are tailored to the engine’s inherent torque axis to disrupt the transmission of vibration and noise. A MacPherson strut front suspension is used with coil springs, a large stabilizer bar, hydraulic ride bushings and side-load-compensated front strut modules. The hydraulic ride bushings in the front control arms provide a smoother ride, better noise isolation and wheel control. The rear suspension incorporates a compound crank (torsion beam) design, with a double-wall, tubular V-shape beam profile with gas-charged twin-tube shocks. It combines all the advantages of a conventional torsion beam axle, including minimal space requirements, with low weight and consistent camber control. Noise-damping urethane spring isolators are used to improve ride isolation and dampen noise. 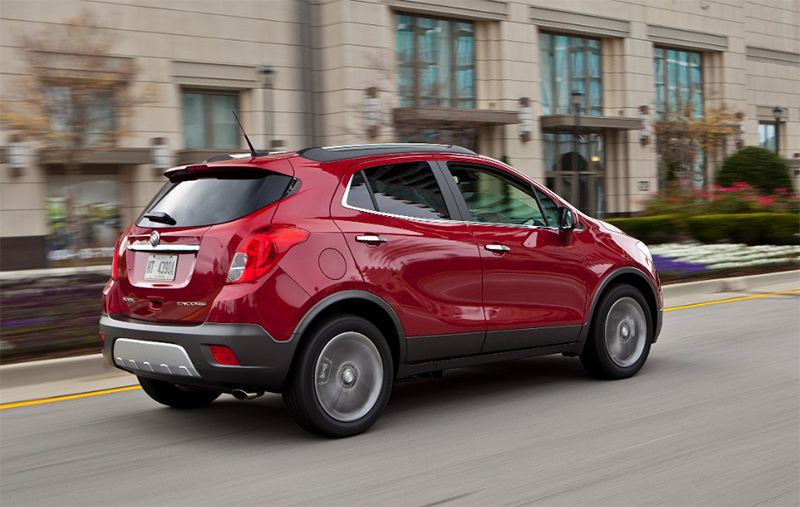 The Encore also features a column-mounted, variable-effort electric power steering system. It contributes to a 36.7-foot (11.2 meters) turning diameter – a tighter turning diameter than the Mini Countryman. It also helps save fuel over a conventional, engine-driven power steering system. Available front and rear park assist. Encore’s safety and security features also include exclusive OnStar technology with Advanced Crash Response System, emergency assistance and more.